It is a long time since we linked to a new historical blog that would be of interest to our readers. So here is one, that seems full of goodies, mostly to do with seventeenth century history, which is appropriate, given its name, but also general discussions about the teaching of history in universities and suchlike matters. The flag was raised four days after the US forces landed on the island and happened after fierce fighting. The photo taken by Joe Rosenthal, who died in August 2006 at the age of 94, won the Pulitzer Prize (deserved for once) and became one of the best known images of the Second World War. Tory Historian is well aware that two photographs were taken as the flag in the first raising was deemed to be too small, but that does not mean that this was a fake. The marines had fought hard to gain the island and the photograph recorded their courage and determination. The excavations conducted by archeologist Eilat Mazar in the Ophel area revealed a section of an ancient city wall of Jerusalem. According to the press release from the Hebrew University, under whose auspices the project was carried out, the dig uncovered the wall as well as an inner gatehouse for entry into the royal quarter of the ancient city and an additional royal structure adjacent to the gatehouse as well as a corner tower. While ancient buildings are not uncommon in the city, the significance of this discovery is the fact that these edifices can be dated to the 10th century before the Common Era — the time of King Solomon, credited by the Bible for the construction of the ancient Temple in Jerusalem. Pottery found at the lowest levels of the dig is dated to this era. Even more telling is the fact that bullae — seal impressions — with Hebrew names were found, as well as seal impressions on jar handles inscribed with the words “to the king,” which means they were employed by the Israelite state in that time. Inscriptions on the jars, which Mazar says are the largest ever found in Jerusalem, showed them to be the property of a royal official. The significance of this extraordinary find is that it provides new proofof the existence and power of the Davidic monarchy, the Israelite state that it led, and the more than 3,000-year-old Jewish presence in Jerusalem. These new discoveries, along with those of a previous dig in a different area of the city of David, contradict contrary Palestinian claims that the Jews have no claim to the area. They also debunk the assertions of some Israeli archeologists who have sought to portray the kingdom of David and Solomon as an insignificant tribal group and not the regional empire that the Bible speaks about. Indeed, Mazar believes that the strength and the form of construction required to build these structures correlates with biblical passages that speak of Solomon’s building of a royal palace and of the Temple with the assistance of master builders from Phoenicia (modern-day Lebanon). Moreover, contrary to those who speak of the Jewish presence in the city as a passing phase in ancient times, the discovery of Jewish seals, which speak directly of an Israelite state, proves that what Mazar has found are not the remains of a Jebusite fort conquered by the Jews but rather of a great city built by David and his son Solomon. Yes, that does stray into the political arena but that cannot be quite avoided. Even Tory Historian recognizes that. As Marc Bloch, the great French historian(though most definitely not a conservative in any form) explained in his last, tragically unfinished book, The Historian's Craft, the past can help us understand the present but the present can help us understand the past. 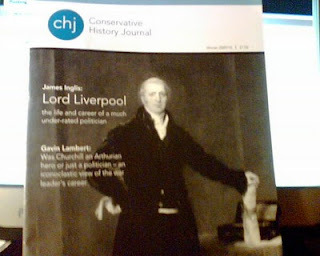 The latest edition of the Conservative History Journal is definitely out. I have a copy in front of me as I type. It's full of goodies: clever and controversial ones. How can anyone resist an admiring article about Lord Liverpool and an iconoclastic one about Winston Churchill? So, you all want to know where and how one can get a copy (except those of you who are already members of the Conservative History Group and have therefore received it or will do so shortly). The CHG address is: PO Box 279, tunbridge Wells, Kent TN2 4WJ. You can either join the Group at the price of £15 per annum or send £7.50 plus £1 p&p just for the Journal. Hurry, hurry. Stocks do not last for ever. No, this is not one of those peculiar games people play in which one is supposed to put together the most unlikely concepts into one sentence but an account of Tory Historian’s jaunt to Leicester last week-end. The pretext was an exhibition of what was billed, justifiably as it turned out, as the largest collection of German Expressionist art in the UK. In Leicester? Tory Historian was somewhat surprised but also fascinated by the tale behind the collection. The exhibition was marking the beginning of that splendid collection: in 1944, a most unlikely moment in history, the then Director of the Museum, Trevor Thomas, put together an exhibition of German Expressionist art, having talked various German refugee collectors, whom the wise British Government of the day had interned, to lend the splendid works they had managed to bring out of their country. The exhibition was, astonishingly, successful both with critics (the local newspapers were rather proud of having such an outstanding and imaginative art gallery director) and the public. The gallery collection was started by several painting purchased from the exhibition and continued to grow, becoming world famous, though not so very well known among British art visitors. The most recent addition to it was a large and fascinating collection of German Expressionist works, particularly of prints, put together by a businessman who had been born in Leicester, Michael Brooks. Tory Historian is delighted to see that the old tradition of businessmen spending money on art or architecture to honour their own city is alive and well. One must tip one’s hat to Michael Brooks and the New Walk Museum and Art Gallery who appreciated the gift. The rest of the day was taken up by walking round Leicester and seeing the Cathedral (a little disappointing) as well some superb churches, the most exciting of which was St Mary de Castro. Possibly the most exciting part of that walk for Tory Historian was the discovery that the City and the good burghers of Leicester clearly never abandoned their loyalty to the one they call King of England, Richard III. He is supposed to have been buried somewhere in the City or, perhaps, thrown into the ditch just outside it in the charming way those Tudors behaved. The story is quite convoluted as this article explains and the truth remains unknown. There are several memorials as well as streets and schools named after the last Plantagenet King. This statue shows him as a young (well, he was youngish though not for those days) and romantic hero with nary a sign of a hump. Eat your heart out, Will. Near the remains of the castle there is a board, put up in 1985, at the 500th anniversary of the year when two kings visited Leicester. 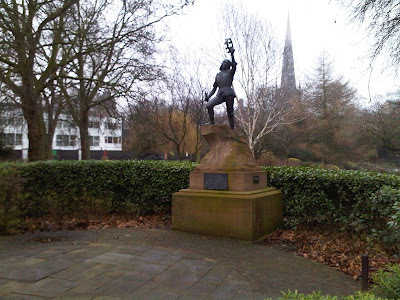 It is quite clear which one the city saw and still sees as the rightful one: Richard III is described as King of England who rode into Leicester some time before the fateful battle of Bosworth Field; Henry VII came to the city on the evening of August 22, after he had “vanquished” Richard and brought his body with him. One can imagine the sullen burghers of Leicester watching the arrogant invader as he rode in with the body of the rightful Kind in the baggage van. How important were the Gordon Riots? The Conservative History Journal is actually at the printer. Phew, I hear people saying. Yes, it will be available very soon. In the meantime, the idea of a journal on line has taken a step forward. Jerome di Constanzo, writer, journalist and un vrai conservateur, has answered my call and sent me this article on the Gordon Riots, an important episode in English history but one that is, as he says, little known. Except perhaps for a few Roman Catholics in Britain, the Gordon riots of 1780 are today almost forgotten by the majority of the British people. This was the last anti-Catholic uprising, which, during a short week gave London a vision of how it might be to live through the Terror. On 2nd June, around 50, 000 people, led by the Protestant Association leader Lord George Gordon MP, marched on Parliament House under banners demanding “No Popery” and with a petition against the Papists Act of 1778, which had been introduced by Sir George Saville, and which sought to reintegrate Catholics into the army and to remove a number of legal disabilities. The demonstrators saw this Act as revoking the Popery Act of 1698 consequently being a reconsideration of the Glorious Revolution’s political settlement. While Gordon was inside Parliament presenting the petition, the demonstrators started to attack the carriages and people trying to enter Westminster. Violence spread – that evening the Sardinian and Bavarian Embassies’ chapels were vandalised. Moorfields close to the City, with its strong but poor Irish Catholic population, became the theatre of a real anti-Catholic hunt with 100 houses burned down and destroyed. Like the Bastille less than ten years after, Newgate prison was largely destroyed as were the houses of the Lords Rockingham, Devonshire and Saville. The rioters, no doubt to give courage to their enterprises, also raided the gin distillery of Langdale in Holborn and after a free pint at the Spaniards Inn in Hampstead, went on to destroy Kenwood House, the home of the Lord Chief Justice, William Murray, 1st Earl of Mansfield. On 7th June the army was given the order to fire on the groups who refused to disperse; martial law was imposed. The unruly mob was no longer solely against Catholics but also against authority in general. Once the violence had started other discontents came into play; those pro and anti war in America, as well as the victims of the poor economic situation helped to take this opportunity to destabilise Prime Minister North’s government. Tempted by this general radical movement, the Whig Charles James Fox declared that he would “much rather be governed by a mob than a standing army”. When the Bank of England was attacked the following day, the army answered firmly. Around 285 people were killed and several hundred wounded. Many rioters were arrested; subsequently 25 were found guilty and executed. Lord George Gordon was arrested for high treason, but was found not guilty. Later the same year the general election saw Charles James Fox win the prestigious Westminster seat with a large majority and given the title of “Man of the people”. The riots had been disastrous for British foreign relations with Catholic continental nations because of the destruction of various embassy chapels, and an important treaty of alliance with Austria failed. Similarities could be found indirectly between the riots and the French Revolution. The rivalry between Fox and North, the extreme ambition of the first, his wish to discredit the second, and his preference for mob rule could have carried Britain’s political system to the same chaos as the French Revolution. For Edmund Burke this time proved turbulent. He vividly remembered his house being guarded in case rioters targeted him because of his Catholic family background and because he was still suspected of being a latent Catholic. He lost his seat in Bristol later that year because of the anti-Catholic movement. Certainly he had during this period looked at evil straight in the eyes. In his Reflections, he referred to the Gordon riots when introducing the extreme and violent criticism made against the monarchy in France, just ten years after the mob devastations of London. He compared the revolutionaries in France with Gordon and how the British system dealt with this kind of extremist character. He ridiculed Gordon’s conversion to Judaism “the Protestant Rabbin”, who although being held “fast” in Newgate – the prison that his mutinous friends had destroyed – was given “a liberty, of which he did not render himself worthy by a virtuous use of it”. Burke concluded this part by proposing an exchange between Gordon and the Archbishop of Paris – not an innocent joke. In 1791, the year of the Reflections on the French Revolution, Parliament voted for the Catholic Relief Act following the new immigration of Catholic clergy escaping the Revolution in order to practise their faith freely. All the questions discussed in the Reflections revolved around the Glorious Revolution. Were the death of absolutism and the achievements of parliamentary rule made manifest by the exclusion of Catholics? Interestingly this question is still relevant today for many progressivist thinkers – the modern take being without religion the world could be better. On the other hand, Burke purposed to achieve the promises of 1688: the complete freedom to believe. The Reflections were an answer to Doctor Price and his pamphlet which celebrated the 100th anniversary of the Revolution of 1688. From this point of view, the Reflections weren’t just 1688 versus 1789, but about a certain perception of the Glorious Revolution: so in fact 1688 versus 1688. One of this blog's most faithful readers called my attention to this article in the Guardian about Mrs Thatcher that takes a few snipes at the lady on the basis of what there is on the newly posted private papers. The truth is that even the Grauniad finds it hard not to be overawed by her. Once we get past all that stuff about her diet (actually, it does not sound all that unabalanced though the lack of carbohydrate makes one wonder) we come to the Guardian's main complaint. The papers also show that her 1987 "no such thing as society" remark, which for many critics defined the immoral truth of Thatcherism, was not off the cuff but was her view as early as 1979. It takes a Gardianista to call an assertion of personal morality immoral but the way that phrase has been quoted out of context has confused many people. Morality is personal. There is no such thing as collective conscience, collective kindness, collective gentleness, collective freedom. To talk of social justice, social responsibility, a new world order, may be easy and make us feel good, but it does not absolve each of us from personal responsibility. It remains true that people glibly talk of new world order and social responsibility without ever wanting to shoulder personal responsibility. That remains too difficult.